While on Mackinac Island for the Spring Fling on Mackinac Island we hit a number of Geocaches including the Sugar Loaf Earthcache. 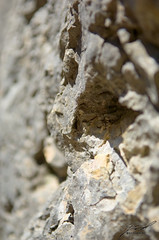 This is a close-up of the stone that makes up Sugar Loaf taken with the 17-55mm lens. Its not the right lens for the job, but it worked pretty well since I wasn't about the haul the whole camera bag down and back up the stairs.